You are here: Home / Blog / Main Dishes / Cheers to the Best Homemade Chili I’ve Had! We’re gearing up for Fall here in the Midwest, and it’s a glorious thing. 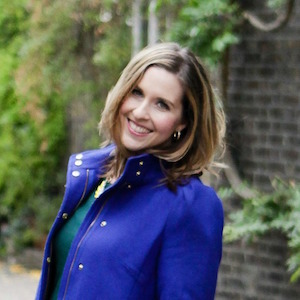 Finally last week we had the temperatures drop briefly, but at least it means that Fall weather is close. And the drop in temperatures had me craving a bit of cozy, comfort food in the form of Homemade Chili. It’s been ages since I made chili, and last time it was a white chicken chili that was delicious. But for some reason, I never really get into making it at home. But that’s absolutely changing with this Homemade Chili recipe! First off, this is a recipe that I barely altered from Laura Lea Goldberg and her cookbook I featured in September. I’m obsessed with this book, and so far I’ve made 2 recipes out of it and they’ve both been fabulous. The other recipe was the Spicy Kale Artichoke Dip, and I loved it! This cooking excursion for Homemade Chili took place on football Sunday. I was hanging out with my boyfriend and was curious how he would feel about chili for lunch, and he was on board. So off I went to whip it up, and I loved how easy this Homemade Chili came together. One thing I try to do is get all of my prep work done in advance, so that it saves me time and makes cooking the dish a lot faster. So that meant that I chopped up my onions and green and yellow peppers first. After that the meat can start getting browned, and cans of beans and tomatoes can get opened and the beans can be drained and rinsed. Let’s talk meat here for a moment, because it’s super important in chili. Laura Lea did a half beef, half ground chicken combo in hers but said turkey could be swapped for chicken. So I did a mix of ground beef and ground turkey, and I really loved how it worked. But when cooking them together, it helps the flavors combine, and you truly don’t even noticed that you’re eating half and half. Once the meat browns, remove it from the pan and melt some butter. Now I went with vegan butter, and you’d never know the difference. Once the butter melts, add the onions and peppers so they soften. Then the garlic goes in with the veggies. Finally you can throw everything else in the pot, and a lot of ingredients go in but all worth it. The meat goes back in along with tons of spices including chili powder, cumin, paprika, and salt. I threw in some jalapeños for added heat, because we love spice. And along that vein, I added 3 tablespoons of Sriracha, and that was a little more than Laura Lea calls for, but she also says adjust to your spice level. Next goes some coconut sugar and molasses and tamari, so think of the coconut sugar as a substitution for brown sugar. It’s just way better for you. Then a large can of crushed tomatoes and small can of diced tomatoes along with tomato paste add to the chili goodness along with black and kidney beans. Now stir and allow it to simmer for 45-60 minutes. I opted to serve mine with pumpkin cornbread, and that was a fabulous decision! I hadn’t made this cornbread in ages, and I had leftover pumpkin from last week’s pumpkin pasta. So it was perfect to toss in the oven as the Homemade Chili simmered. And when you’re ready to serve it, a lovely drizzle of honey is perfect. Or you can be like my fella and just toss it into the bowl of chili for a little flavor and texture! The amount of goodness in this Homemade Chili blows my mind, because the chili shines with awesome flavor and textures. It’s thick and smells fantastic, and you’ve got a slight sweetness from the sugar and molasses. But then the tamari adds some salty depth, Sriracha and jalapeños give it some nice heat, and the peppers, onions, meat, and beans add TONS of texture. When you serve your chili, top it with your favorite stuff! We went with green onions, shredded cheese, pumpkin corn bread (see above), and tortilla chips were also a fun add in. In fact the tortilla chips made me think of Frito chili pie a bit, in case you’ve had that before. 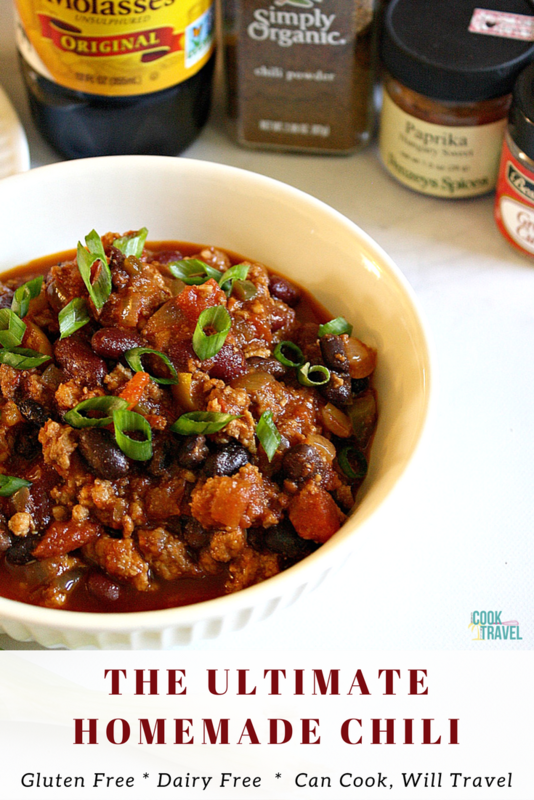 My mouth is watering just thinking of how delightful this Homemade Chili is! 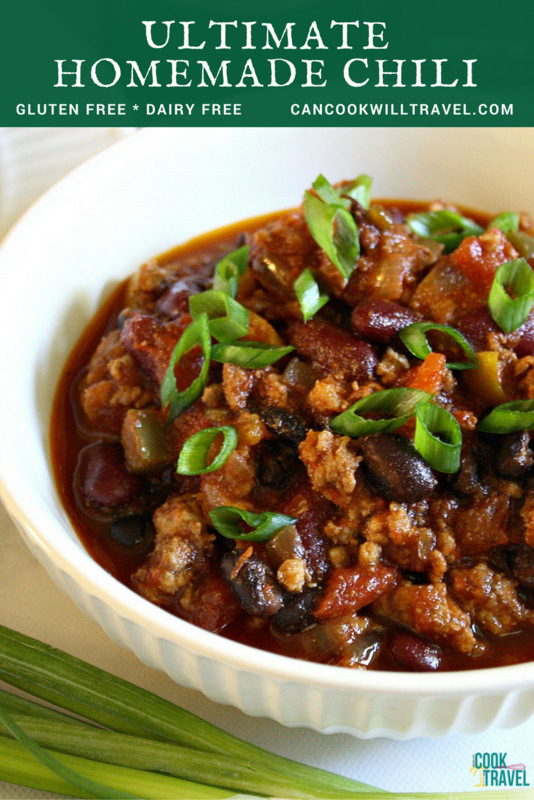 Several trips back for more chili happened, so luckily this recipe makes several servings. We really enjoyed it, and it was perfect for football Sunday! 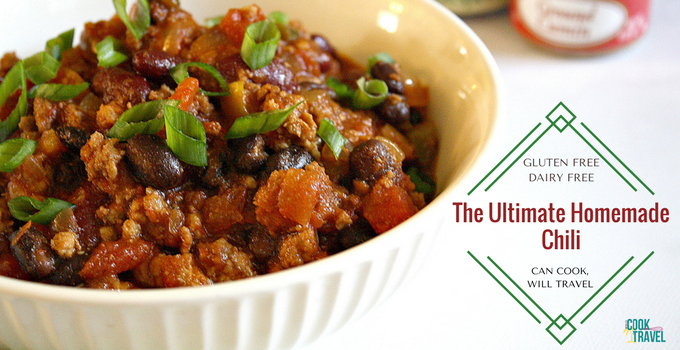 You may just find your favorite Homemade Chili recipe right here, because I know I sure did! Click that link for the recipe and step by step instructions, and happy chili making!! One year ago: Wagamamas Chicken Ramen is Hella Good!! Two years ago: Paleo Pumpkin Bars = How to Satisfy Your Sweet Tooth With No Guilt! Five years ago: Broccoli Cheese Soup Becomes Fancy! Six years ago: Officially a Fan of Meringue!